Our last day in Spain. We ate earlier this morning then walked across the street and looked at the boats. It was another beautiful day. From there we walked to the Palau de la Musica Catalana where we had reserved an 11:00 tour in English. 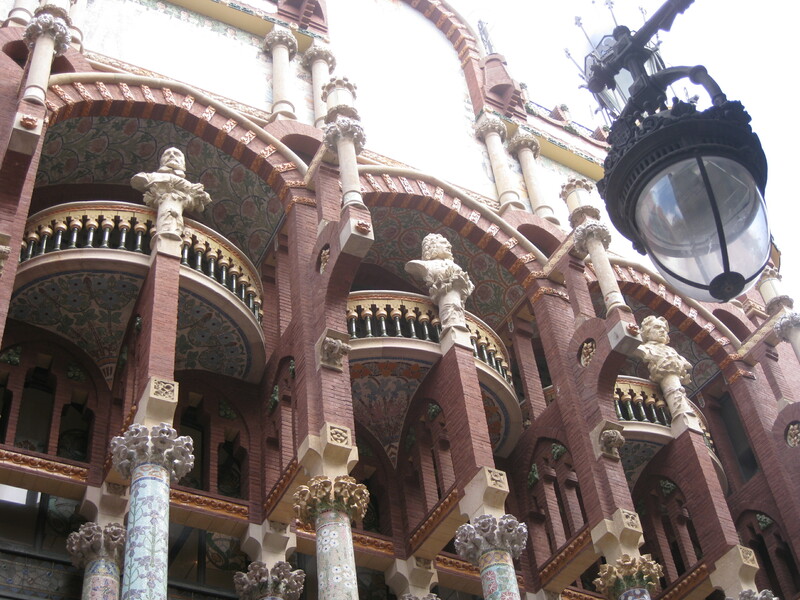 The concert hall was designed in the Catalan modernistic style by the architect Lluis Domenech i Montaner . 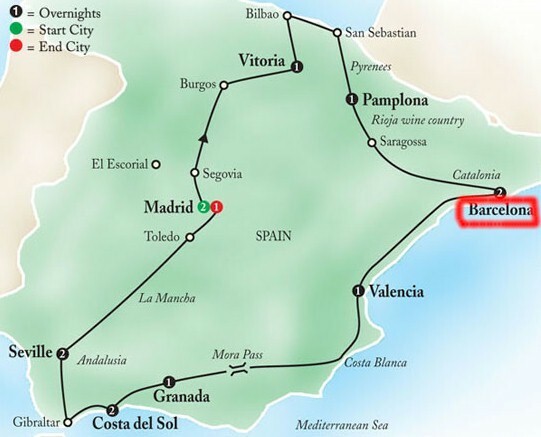 It was built in between 1905 and 1908 for the Orfeo' Catala, a choral society founded in 1891 that was a leading force in the Catalan cultural movement that came to be known as the Renaixenca (Catalan Rebirth). It was inaugurated February 9, 1908. The façade has two colonnades on the second-level balcony of the main façade. Each column is covered uniquely with multicolored glazed tile pieces in mostly floral designs and is capped with a candelabrum that at night blazes with light. Above the columns are large busts of Geovanni Pierluigi da Palestrina, Johann Sebastians Bach, and Ludwig van Beethoven on the main façade and Richard Wagner on the side. 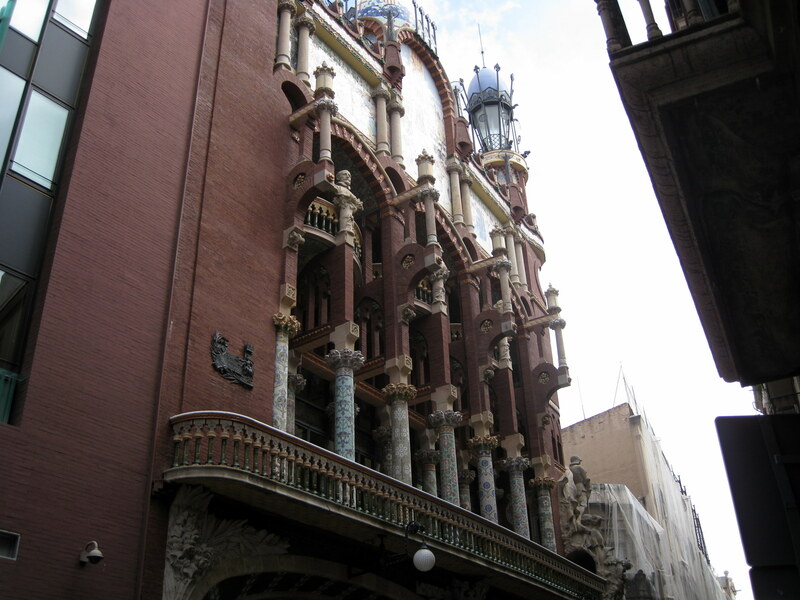 The top of the main façade is a large allegoric mosaic by Lluís Bru that represents the members of the Orfeó Català, but it is impossible to see it clearly from the narrow street below.The concert hall of the Palau, which seats about 2,200 people, is the only auditorium in Europe that is illuminated during daylight hours entirely by natural light. The walls on two sides consist primarily of stained-glass panes set in magnificent arches, and overhead is an enormous skylight of stained glass designed by Antoni Rigalt whose centerpiece is an inverted dome in shades of gold surrounded by blue that suggests the sun and the sky. It was really beautiful, but sadly no photos were allowed. We had made 1:00 luncheon reservations at the Casa Calvert before we left home. 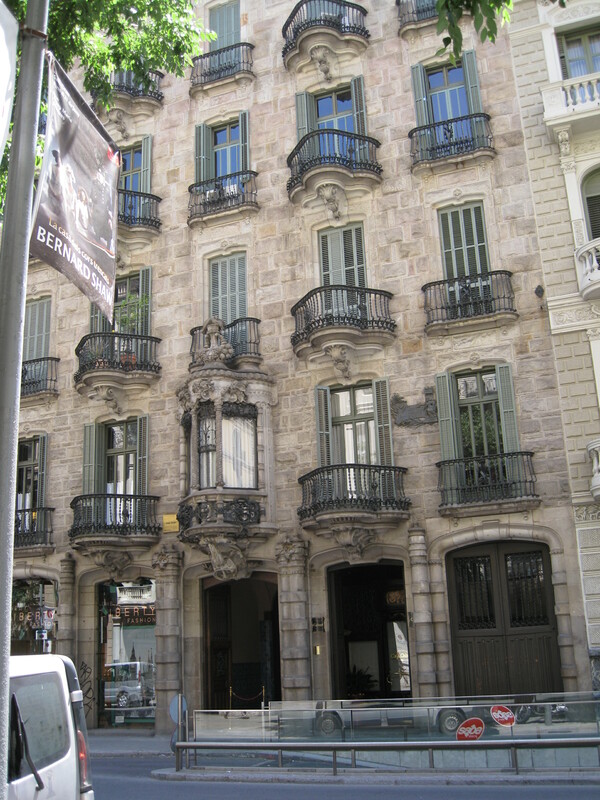 Casa Calvert is in a building designed by Gaudi. We were rather early so we walked for about 45 minutes around the neighborhood which was quite interesting. When we were seated, we were the only guest in the restaurant. More came in later. Next to us was a young lady with a small child who ran a toy truck around on the floor. It was rather annoying since this was such a fine eatery, and we were going to pay big bucks for lunch. She finally feed him, nursed him and finally took a nap. We had crab croquette with crispy “things” for a start. My wife had a steak and I had sole with eggplant in the middle. They brought the bill in sort of a little box. After we left, I realized that I had forgotten to leave a tip. I sent a note with a tip in the mail from the hotel. I hope they got it. We walked back towards the hotel. My wife had read about a neat Cava bar that was near the Picasso art gallery. We found the bar and had Cava and a few snacks. There were several gift shops nearby that sold tiles and ceramic gifts. We finished buying our gifts for our family. We stopped at another store bought some inexpensive jewelry. After a nap in the hotel, we went up to the roof terrace for drinks. 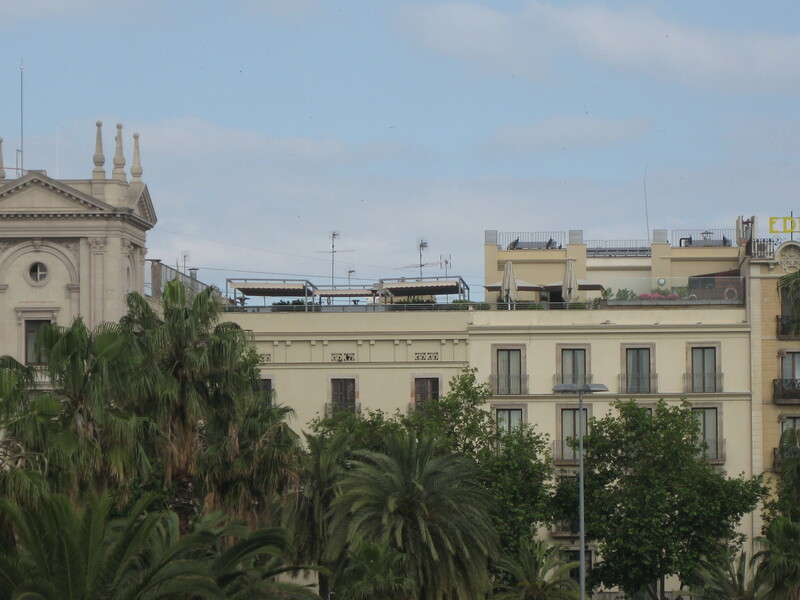 (the picture on the right is our roof terrace from the street) It was warm and sunny but there was a breeze. Again the bartender wasn’t up there. My wife went down to the desk and put in our order. When they finally brought it, my Jack Daniel turned out to be scotch but I drank it anyhow. Tonight was the final soccer game with Barcelona playing Manchester United in Rome for the championship. From the roof terrace we could hear music and some talking coming from near the sea coast. So we walked down two blocks to the monument of Columbus at the end of the Ramblas. Thousands and thousands of people where walking down the Ramblas headed to the area where the music was. We understood that there was a large screen area where people could watch the game. We walked over near a bridge over which all of the people were walking; carry their flags, horns and refreshments. We decided not to walk closer. Our hotel was having a special celebration dinner, but no one was there so we walked down the Sailors, the outdoor café were we had lunch the first day. We had the same waiter who remembered us. They had a large television facing the outdoor café. We had tapas – omelet, mushroom, meatballs and white beans and a dessert. Barcelona won just as we finished eating. The town went wild. We walked back down to the Ramblas and watch the hordes of people walking back up the Ramblas from the area on the water. They were rather orderly. They had closed the Kolon Street in front of the hotel for a while. 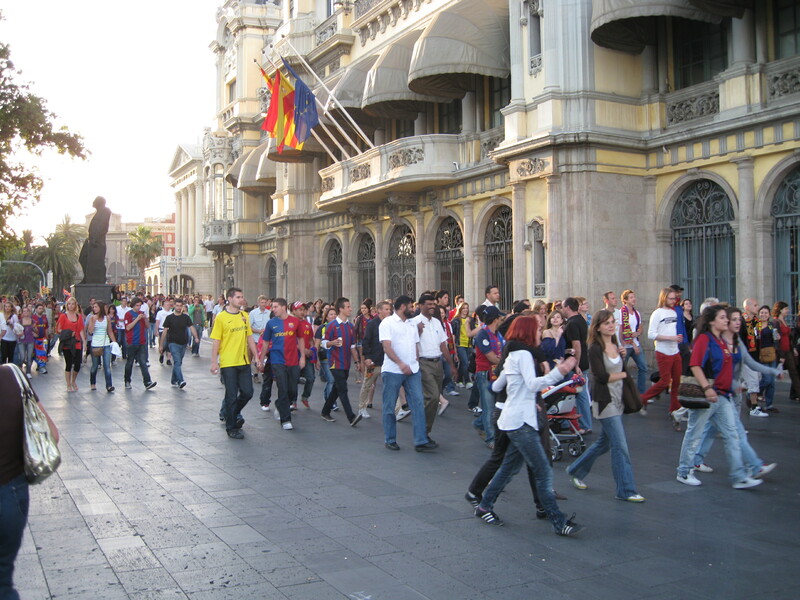 There were a lot of people going by on the side walk headed to the Ramblas. After while they opened the street and for half the night cars went up and down the street honking with people leaning out the window waving flags. We knew that we wouldn’t get much sleep that night. The next morning, we called a taxi to take us to the airport for our flight home. We had a couple hour layover in Madrid. We arrived home safely. It was a wonderful trip. We would like to do part of it again and see some of the churches we missed on the tour. We especially loved Barcelona.